Butner's pass of 6.648-seconds at 207.46 mph in his Jim Butner's Auto Chevy Camaro from Friday held strong to keep him atop of the Pro Stock category. He already has two wins in the 2019 season and is in the hunt for his second career win at the facility. "We have a good car," Butner said. "We've had a good car since I sat in it. We're just out here having fun. That's probably one reason we've had a little bit of success. This isn't our life, but we do have fun and enjoy it." "Now we kind of know how to win, and I've learned a lot. It's still a good race car. It went down there four times, and we only have to go down three tomorrow, so I'm very happy and can't wait." "We're serious about what we're doing," Salinas said. "What I don't know, I'll find. We know what won't work tomorrow." In Funny Car, Wilkerson picked up his first No. 1 since Bristol 2017 in his Levi, Ray & Shoup Ford Shelby Mustang. His pass of 3.895 at 323.50 led the category. He was the runner-up at the Gainesville event and is looking for his first win since 2016. Wilkerson will line up for Round 1 against a quadrant of Robert Hight, Shawn Langdon and Jeff Diehl. "I'm really proud of how good our car runs," the veteran driver said. "It's been a long time since we've been No. 1 qualifier, but I kind of pull that out of my hat every once in a while, if you'll notice. It might take me a year or two sometimes, but I'm there getting it done." 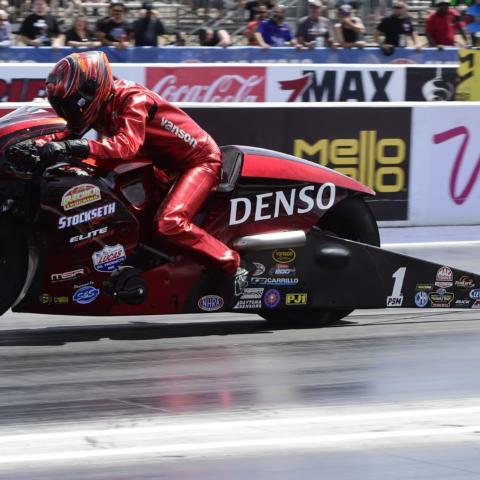 Defending Pro Stock Motorcycle world champion Smith snagged the top spot with his lap of 6.879 at 196.76 on his Elite Performance/DENSO Auto Parts/Stockseth EBR during the third qualifying session. Smith will be in a quad of Angelle Sampey, Ryan Oehler and his wife, Angie Smith. This is his first No. 1 at The Strip at Las Vegas Motor Speedway and his first of the 2019 season. "With all the people who help us, we call that thing the 'Red Rocket,'" Matt Smith said. "It truly is fast. It throws numbers out. "Sometimes it's not supposed to go that fast, and it wasn't supposed to go that fast Q3, but it did. We'll take the green hat, and hopefully we can turn three win lights on tomorrow and go three rounds and win this race." Eliminations will begin Sunday at noon Pacific Time. Leah Pritchett, 3.743, 328.06 vs. 13. Terry Totten, 3.951, 297.68 vs. 5. Clay Millican, 3.750, 325.06 vs. 12. Austin Prock, 3.829, 316.97. J.R. Todd, Camry, 3.919, 323.43 vs. 13. Gary Densham, Mustang, 4.057, 312.13 vs. 5. Matt Hagan, Charger, 3.924, 327.03 vs. 12. Jim Campbell, Charger, 4.044, 313.00. Matt Hartford, Camaro, 6.665, 206.51 vs. 13. Shane Tucker, Camaro, 6.724, 204.57 vs. 5. Rodger Brogdon, Camaro, 6.665, 206.39 vs. 12. Chris McGaha, Camaro, 6.707, 205.57. 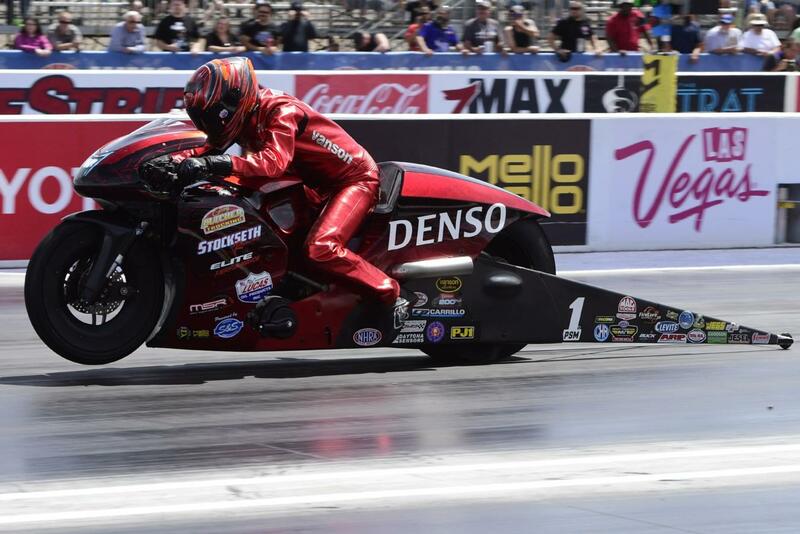 Andrew Hines, Harley-Davidson, 6.903, 194.83 vs. 13. Joey Gladstone, EBR, 7.010, 190.65 vs. 5. Karen Stoffer, Suzuki, 6.947, 193.49 vs. 12. Jim Underdahl, Suzuki, 6.997, 190.43.